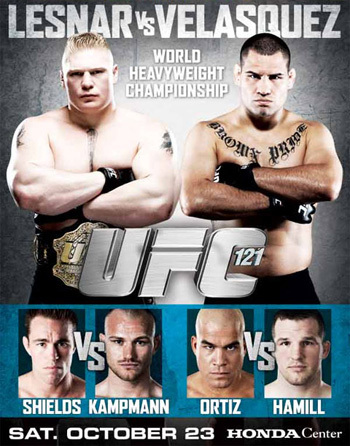 Watch Video Replay Brock Lesnar Vs Cain Velasquez UFC 121 Results - We'll the UFC 121 Results are in and Cain Velasquez destroyed Brock Lesnar. It's obvious﻿ that Brock's standup isn't very good yet. But what's more telling I think is that he just doesn't like to get hit. Will Brock Lesnar will regain the UFC heavyweight title? UFC could easily manipulate the matchups so that Lesnar eventually wins again. That's the downside of having one organization run everything without some kind of ranking system in place. It's in a position to pull any matchups out of its azz. Bottom line, Lesnar will be fine, he is still learning and right now he is a one trick pony and he just needs to learn a backup technique that will allow him to be successful in the event he can't bulldoze someone and GnP his way to a win. Watch this UFC 121 Picks fight replay in full Video by Clicking Here. More UFC 121 Results to come. Bet on all the Upcoming UFC Picks fights at Sportsbook.com and they will give you a 25% Sign Up Bonus right now that you can use on Sports Betting NFL Picks and College Football Picks. Open up an account today and get this promotion.